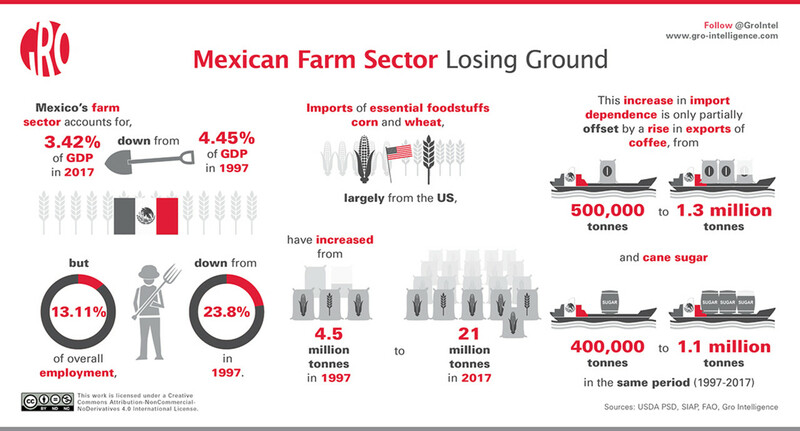 Mexico’s agricultural sector has retained great importance to the overall economy even while other industry boomed around it. 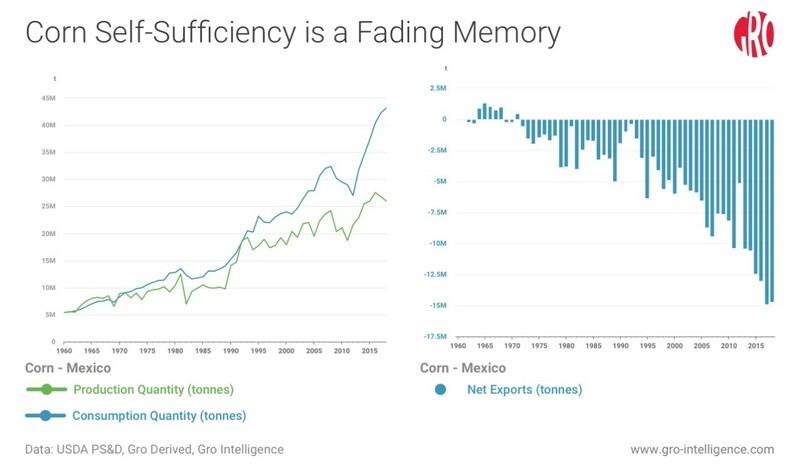 But modernization and commercialization haven’t moved quickly enough to prevent Mexico from becoming increasingly dependent on food imports. Gaps between domestic production and consumption have widened substantially for such staples as corn and wheat. To avert further worsening of deficits in domestic supplies, policymakers need to explore multiple alternatives. One of the more promising possibilities is an expansion of the country’s digital infrastructure. The subject will be explored in a panel discussion at Mexico’s annual Global Agri-Food Forum in October, organized by the country’s National Agricultural Council. Modern digital analytical techniques can help farmers establish optimal planting and harvest times, make forecasts of necessary inputs, determine crop mixes, feed rations, and herd sizes, among many other things. However, such techniques to date remain largely unexploited in worldwide agriculture, and the average agricultural manager still lacks digital tools considered basic in other, more financially productive industries. A 2015 study by McKinsey Global Institute showed that of 22 US industry groups, agriculture consistently fell into the lowest level across all nine metrics of digitization. How much does this underperformance cost the global farming industry in lost productivity due to poor decisions made with inadequate information? For policymakers and agribusiness executives, easy access to properly organized agricultural statistics can better inform the decision process at reasonable costs of both time and money. Even more powerful cases appear when leaders push quality information down to lower levels, so that entire organizations can benefit. In the rest of this article, we will show examples of digital analyses that could potentially help Mexican agriculture become more responsive to changing circumstances, effectively increasing productivity. And, given the significant local impacts expected from climate change, some sort of early-warning system could be highly beneficial. 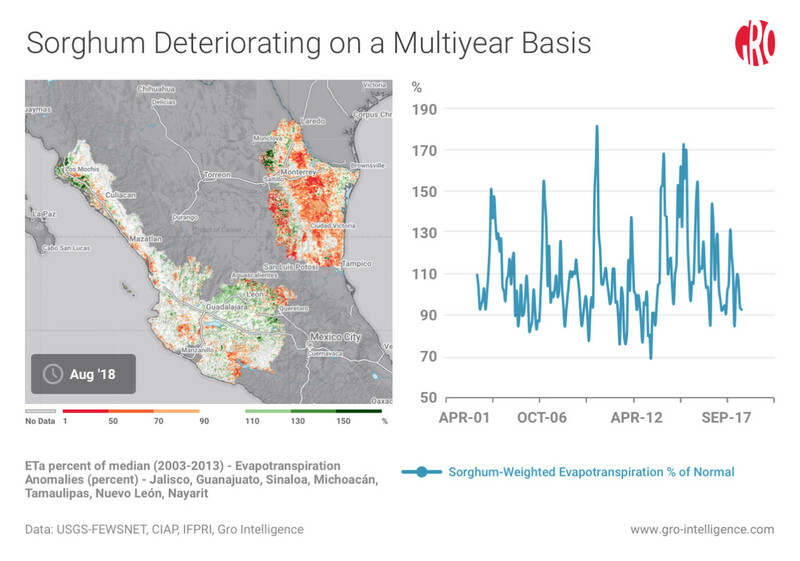 A great example of the utility of analysis of satellite imagery comes from Mexico’s devastating 2011-2012 drought. Problems became apparent as early as April 2011, when Coahuila, San Luis Potosí, Sonora, Tamaulipas, and Zacatecas states all simultaneously registered severely dry conditions on multiple satellite- and ground-based indices. While many farmers had already committed to ambitious plans for the year, some still had time to alter decisions or at least reduce risk around the margins. Most of them had no idea of the huge scale of the event unfolding, however, and went full speed ahead into a disastrous harvest. For their part, processors and consumers could have hedged against higher prices, but unaware of alarming signals such as those in the charts below, generally did not. 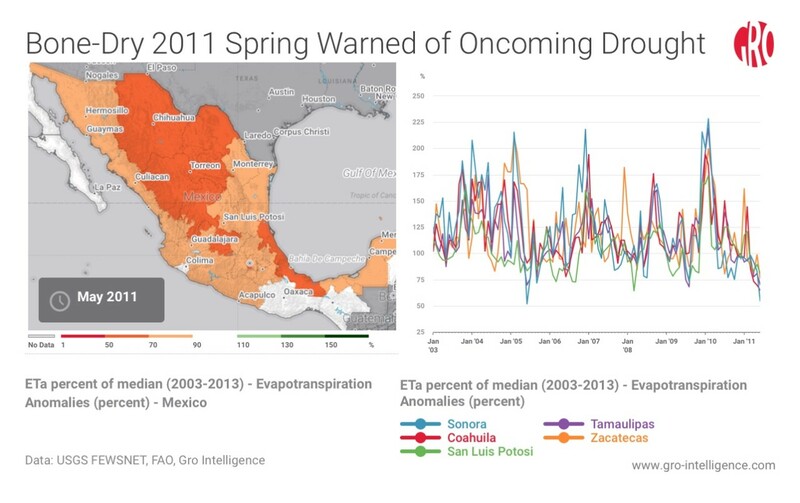 These charts are two views of the same thing—evapotranspiration statistics in multiple Mexican states as they descended into the catastrophic drought of 2011-2012. The inexpensive availability of high-quality satellite imagery has the potential to give decision-makers at multiple levels actionable intelligence that adds real value. That potential is mostly unrealized because unprocessed images or even raw geospatial data have limited applicability on their own. To extract insights, users need an intermediate level of processing and manipulation. In short, they need satellite data quantified and aggregated to known geographic regions in appropriate ways. 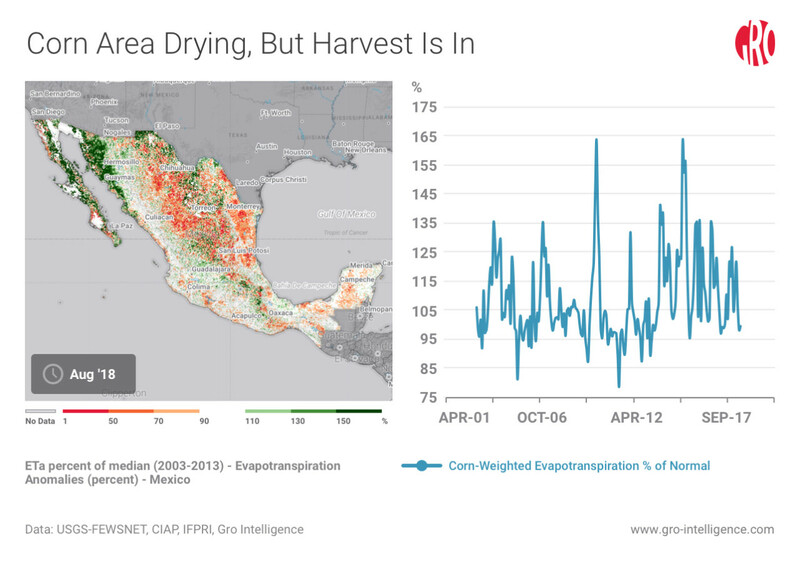 Gro Intelligence experts, who will be participating at Mexico’s Agri-Food Forum, have done that work and more, allowing analysts to take the next step and combine satellite-weather and crop-health data from the US government’s FEWS NET, which tracks evapotranspiration rates and other indices, with known crop-planting areas from the IFPRI database, a global cropland map. This process leads to single health indices for every crop-country pairing globally. In the Mexico case, we supplemented IFPRI with data from SIAP, Mexico’s national statistics database on agriculture. 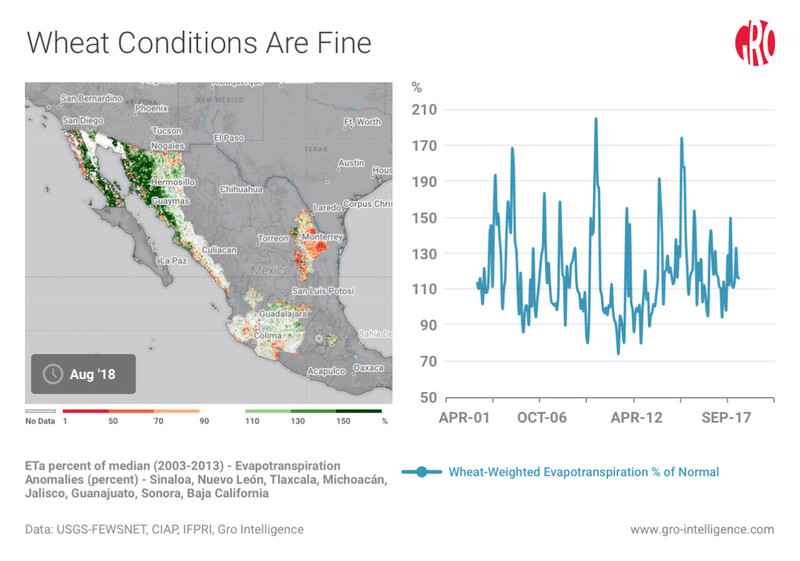 In the following analyses, Gro Intelligence used evapotranspiration anomalies (ETa), which are the deviations from seasonal averages of a variable called evapotranspiration. We can calculate evapotranspiration because satellites allow us to see water’s evaporation from the ground and transpiration through plants. Since every instance of the photosynthetic process includes transpiration of water, this data provides excellent measurements of plant health and progress. When aggregated by the presence of crops of interest in known regions, the data gives us a good estimate of that crop’s health regionally, nationally, or even globally. Corn secures the No. 1 spot as the most consumed grain in Mexico. Used in almost every popular cultural dish, corn consumption is outstripping growing production, leading to the country importing larger quantities each year. 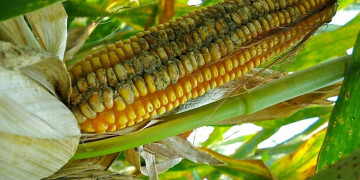 Farmers cultivate corn all over Mexico. Excessive dryness is plainly visible on the map of evapotranspiration anomalies, below, particularly in the eastern two-thirds of the country. Aggregating the data by corn-harvested area gives us the chart on the right, which shows a current value of 98.8 percent, significantly below the historic mean of 108.2 for this time of year. Since farmers have mostly harvested the summer crop already, current dryness doesn’t present a huge challenge, but it bears close surveillance going into next year. A very high irrigation percentage for the winter crop would mean that weather conditions will have less impact on its health. The left chart shows a map of evapotranspiration, with drying visible in the eastern two-thirds of the country. The chart on the right shows the same data aggregated by corn-harvested area. The current evapotranspiration value is 98.8, well below the mean for this time of year of 108.2 with a standard deviation of 14.6. 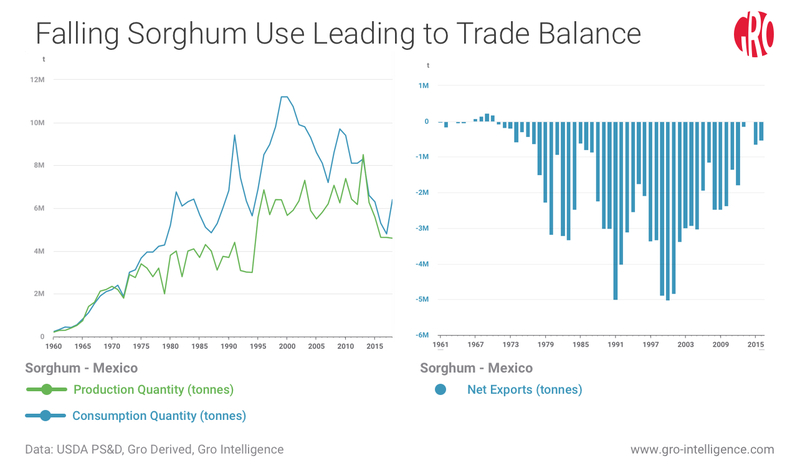 The Mexican sorghum trade balance has improved but remained negative. 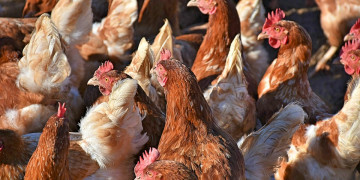 A surplus could be in the making due to increasing use of corn as feed for livestock, replacing sorghum in its primary role as meat demand climbs. Some of the same issues face the sorghum crop that face corn. But sorghum production is clustered on the East Coast, so the dryness visible there, see map below, presents a potentially greater threat. As is the case with corn, the sorghum crop’s 2018 harvest has ended, but a multiyear drying trend apparent on the right hand chart below could lead to trouble for next year’s crop. The left chart shows a map of evapotranspiration with drying visible in the eastern part of the country. The chart on the right shows the same data aggregated by sorghum-harvested area. The current value is 92.2 and the mean for this time of year is 108.3 with a standard deviation of 20.9. In Mexico as elsewhere, harvested wheat mainly becomes flour which consumers use for bread and pastry products. Booming demand has accompanied rising prosperity levels, and consumption has completely outstripped production. As in the case of corn, Mexico has a large and growing dependence on imports. As we move into the winter wheat planting season, conditions look optimal. 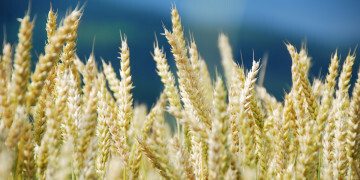 Wheat’s heavy crop weighting on the western side of the country has boosted the outlook due to better conditions there than in the eastern and central regions. The wheat crop-weighted evapotranspiration value of 115.8 (right side, below) sits within a narrow margin of the mean and presents little threat to the planting of the 2019 crop. The chart on the left shows a map of evapotranspiration, with drying visible in the eastern part of the country, but excellent conditions in the West. The right-hand chart shows the same data aggregated by wheat-harvested area. The current value is 115.8 and the mean for this time of year is 118.1 with a standard deviation of 23.7. Cultivation of sugarcane is a success story for Mexican agriculture. 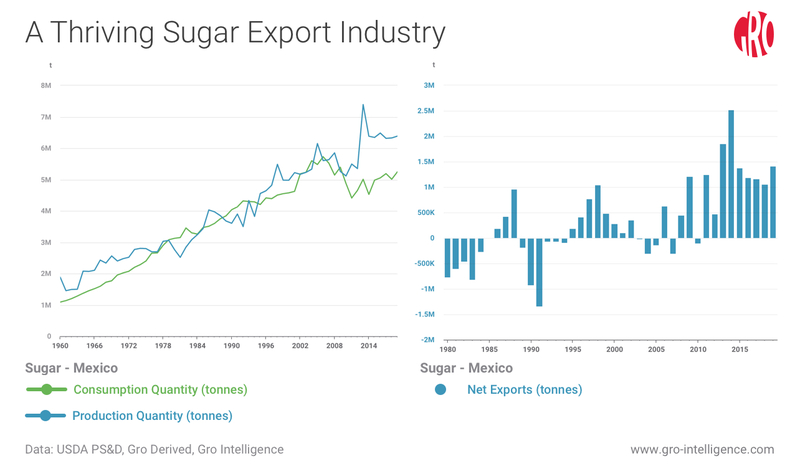 Persistent demand growth in the sugar-loving US has led to a large trade surplus for Mexico. The country’s plentiful humid lowland geography lends itself to sugarcane production, and the industry has had a salutary effect on the economy at large. There is one caveat, though: The increasing use of high fructose corn syrup as a substitute for sugar has helped to maintain the positive trade balance for sugar at the expense of a bigger deficit in corn. 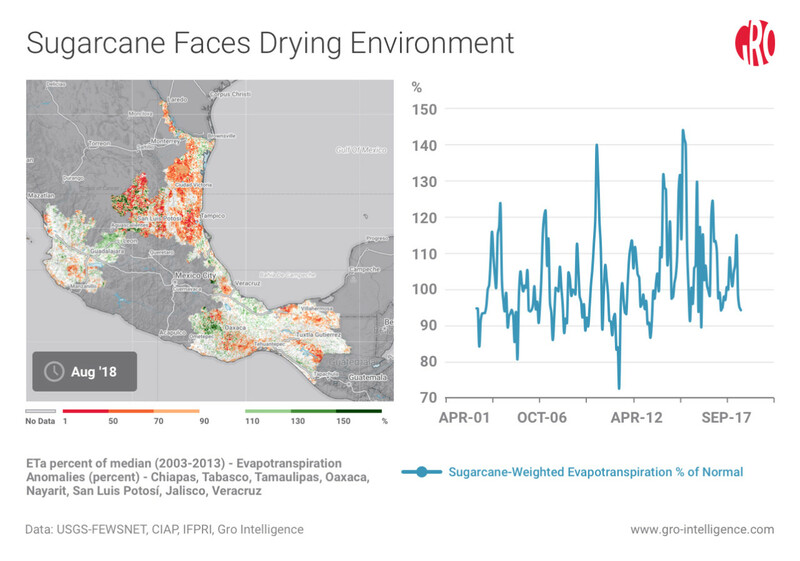 The situation looks dicey for the beginning of the traditional sugar season in southern and eastern Mexico, as we run up to the main harvest in the beginning of 2019. Evapotranspiration has fallen to 94.1 percent of the mean for this time of year, a significant deviation given the general lack of variation in the tropical climate. The left-hand chart shows a map of evapotranspiration with drying visible in the eastern and southern parts of the country. The right-hand chart shows the same data aggregated by sugar-harvested area. The current value is 94.1 and the mean for this time of year is 102.5 with a standard deviation of 11.8. Currently, Mexican commodity agriculture has also succeeded brilliantly in coffee. Despite a hiccup due to weather in the 2016 crop year, exports have roared back, and a healthy positive balance has reappeared. Almost all of the exports are headed to the US. 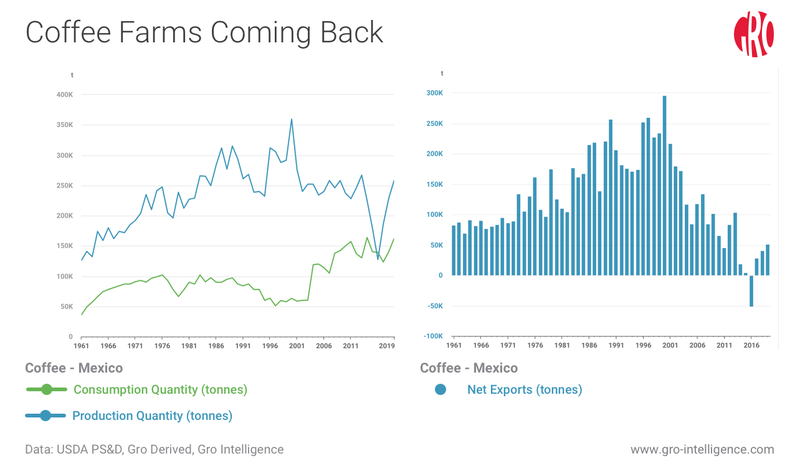 High-value coffee exports help somewhat to offset Mexico’s growing imports of food staples. Tree crops like coffee grow and are harvested almost year-round. 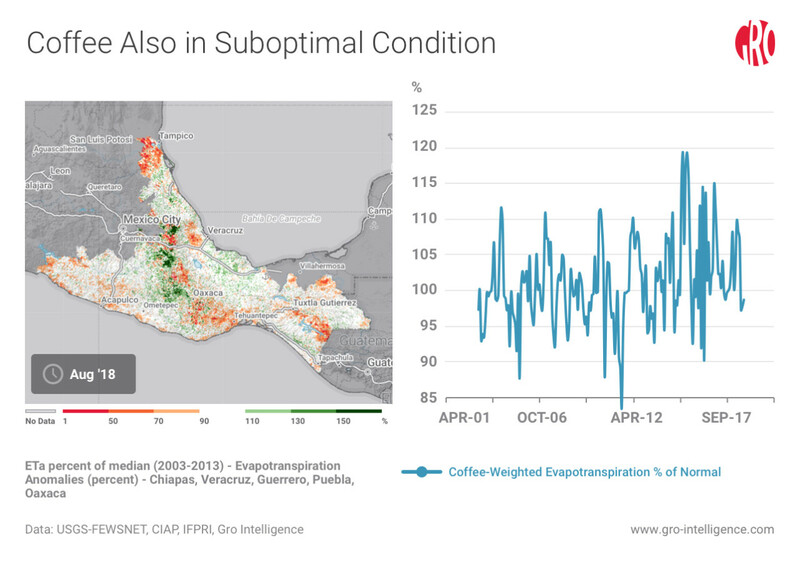 The traditional picking season for coffee cherries starts in September, so the below-average current state of evapotranspiration in the coffee-production areas should raise concern. In a historical sense, the levels of plant activity aren’t too bad. But a subnormal harvest shouldn’t be a huge surprise, given the satellite indications. The chart on the left shows a map of evapotranspiration with patchy drying throughout the growing area. The right-hand chart shows the same data aggregated by coffee-harvested area. The current value is 98.4 and the mean for this time of year is 101.0 with a standard deviation of 6.5. 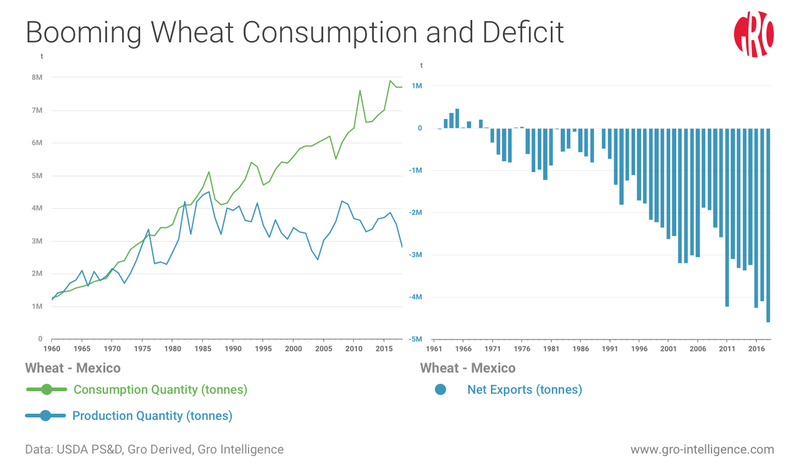 Clearly, Mexico has built a significant agricultural-import dependence over the past 20 years. Especially in the currently tense environment for trade, such a dependence on potentially unreliable partners can suddenly become painful. One failed crop can lead to soaring, and mandatory, prices for necessary foodstuffs. Given the serious implications of potential shortfalls, and the vast potential for a new, optimized Mexican agriculture, it seems that digital-data investments could pay huge dividends. The ability for decision-makers at all levels to make adjustments in real time could easily make the difference between a great year and a mediocre one.